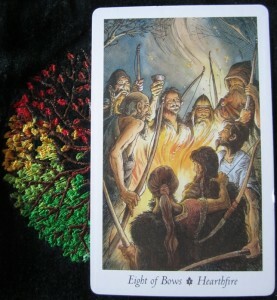 Today comes the card from my eldest son and he picked out the Eight of Bows, with the keyword of “Hearthfire”. If you wanted a card to celebrate the family of man, this would be it. This card is so very different from the Eight of Wands in the RWS, but there’s still a lot going on, still a lot of impact occurring with this card and these men. Note, not a single woman / female in site! Unlike the Eight of Wands in the RWS, this card is full of hope. The RWS to me is more destruction, more mess. This card carries on the theme from yesterday with the Three of Vessels with the keyword of Joy. There’s a shared consciousness of the human spirit with this card on a grander and more obvious. We celebrate the fact that we endure, survive, thrive and grow with the support and companionship of whatever our chosen tribe. 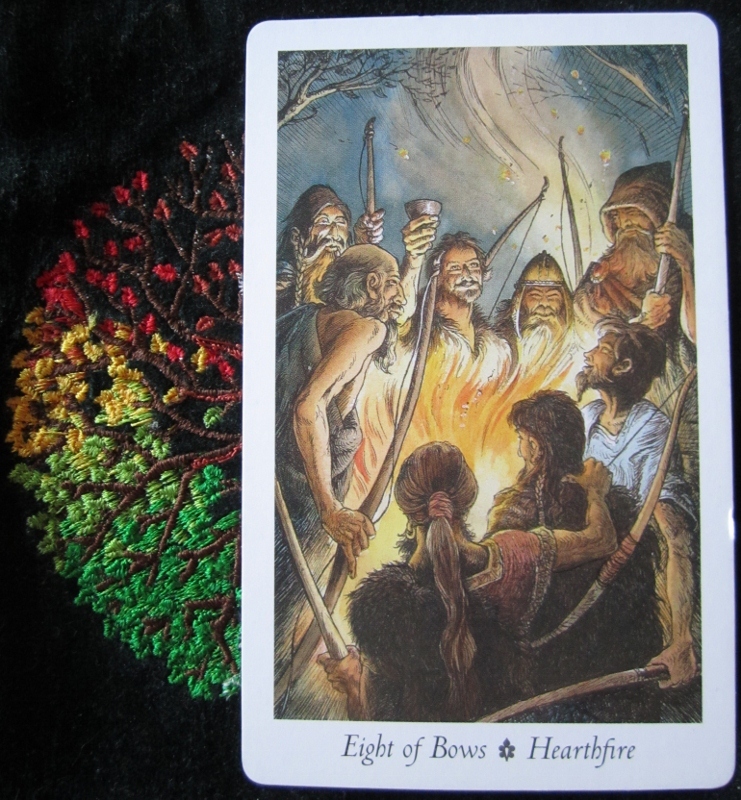 It’s time to be thankful, time to take the sacred fire of friendship and comradeship and treasure it, appreciate the fires and situations that forged them. So, when you spend time with the friends we have, give thanks to whatever God or Goddess you worship, give thanks for that love. So to TABI, Theresa Reed, Alison Cross, Vivanne Kacal, Ania Marczyk and to other Tarot Readers that inspire me: Thank you!